Gmail is getting better and better, if not yet considered to be the best free webmail service in the world. One of the latest addition to Gmail’s long list of features is Mail Fetcher. The Gmail Mail Fetcher is a functionality that allows Gmail users to retrieve, fetch or download mail from other remote non-Gmail POP3 email accounts and mailboxes, so that Gmail users can access to all external non-Gmail emails within one Gmail interface, in just one Gmail inbox. Best of all, by doing so, your emails from other limited features email accounts (provided they allow POP access) will be able to take advantage of the great Gmail features, including the massive 2.7 GB and growing email storage space. Currently Gmail Mail Fetcher able to support and read up to 5 external email accounts with POP access (POP3 enabled). The Mail Fetcher feature is been slowly rolled out to all Gmail users, but once your account is enabled for Mail Fetcher, you will be able to see “Get mail from other accounts: (download mail using POP3)” option in the Settings -> Accounts tab. To set up mail fetcher to download and retrieve emails from external email accounts, simply click on “Add another mail account”, and then enter the full email address of the account you’d like to access, then click Next Step. Gmail will populate the Username and POP Server plus Port fields whenever possible, based on your email address, check if it’s correct, and then enter your Password. There are several options such as whether to leave a copy of retrieved messages on the server, use secure connection (SSL) when retrieving mail, label incoming messages or archive incoming messages can be set or applied. Google provides detailed explanation here. Once done, click on Add Account. Once the external mail account has been added, Gmail will periodically and automatically check and download any new incoming emails. You can see or view the history of the mail fetching, or you can also manually trigger the mail checking process by pressing on “Check mail now”. Beside, Gmail also has a neat feature where you have the option of setting the external email address as a custom From address. This allows you to compose messages in Gmail, but have them appear to be sent from your other email account. If you haven’t has the particular email address set as a supported and verified email address which can be used as “Send Mail As” email address, Gmail will automatically prompt you to create one once Mail Fetcher setup completed. Click Yes to set up a custom From address. One major limitation is that if you try to consolidate all Gmail accounts into one by retrieving and fetching and downloading emails from other Gmail accounts, you’re out of luck. 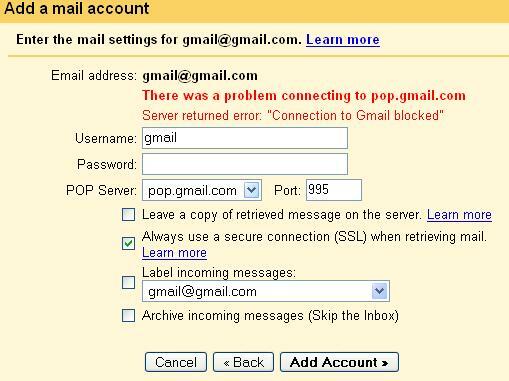 Although Mail Fetcher will automatically fill in the appropriate and correct Username and POP server settings, however, you will get a error saying that there was a problem connecting to pop.gmail.com, with description saying that “Server returned error: “Connection to Gmail blocked””.